1285187814 -Place yourself in the midst of today’s fast-paced exhilarating world of advertising with O’Guinn/Allen/Semenik/Close’s ADVERTISING AND INTEGRATED BRAND PROMOTION, 7E. This powerful and practical cutting-edge text draws from the authors’ vast experiences in the boardroom and classroom to give you intriguing insights into advertising in the real world. With ADVERTISING AND INTEGRATED BRAND PROMOTION, 7E you’ll see how good advertising is the result of hard work and careful planning. The comprehensive online companion to the printed text provides integrated discussion of video and other medium heretofore unavailable to be illustrated in traditional print delivery. 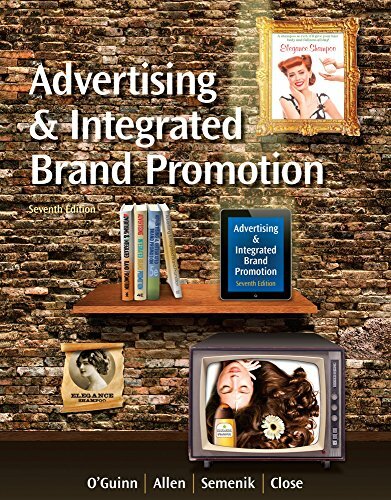 A leader for its emphasis on integrated brand promotion, this edition combines a solid understanding of advertising strategy and important theory with real-world applications. The book’s integrated learning experience gives you hands-on practice putting chapter concepts into action. This clearly written text brings a solid understanding of advertising strategy to life with more dynamic visuals and graphic examples than ever before. Today’s most contemporary ads and exhibits combine with coverage of the latest practices and industry developments, including social media, design thinking, and an emphasis on globalization. The book’s focus on real advertising practice is reflected in the book’s contents that follows the same process as an advertising agency. Trust ADVERTISING AND INTEGRATED BRAND PROMOTION, 7E to equip you with the tools, knowledge, and practice to get results in advertising and business today.